I took a bus from Prague’s Smíchov train station to Mníšek pod Brdy, where the chateau was close to the main square. The ride lasted only a half hour. It was my second time here. During my first visit in 2004, only one tour had been available. 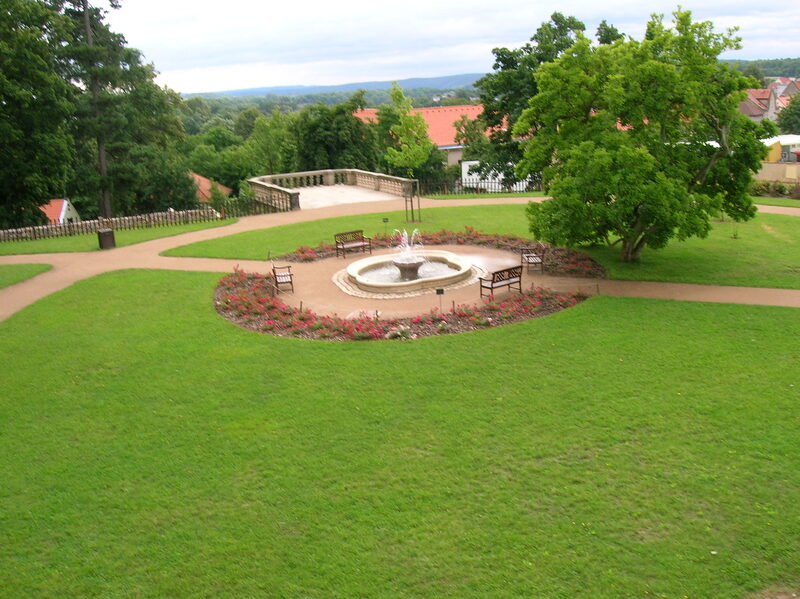 Then, in 2011, the chateau began offering two routes. I was eager to see what awaited me on the new tour. Because I had already been here, I knew the basic history. 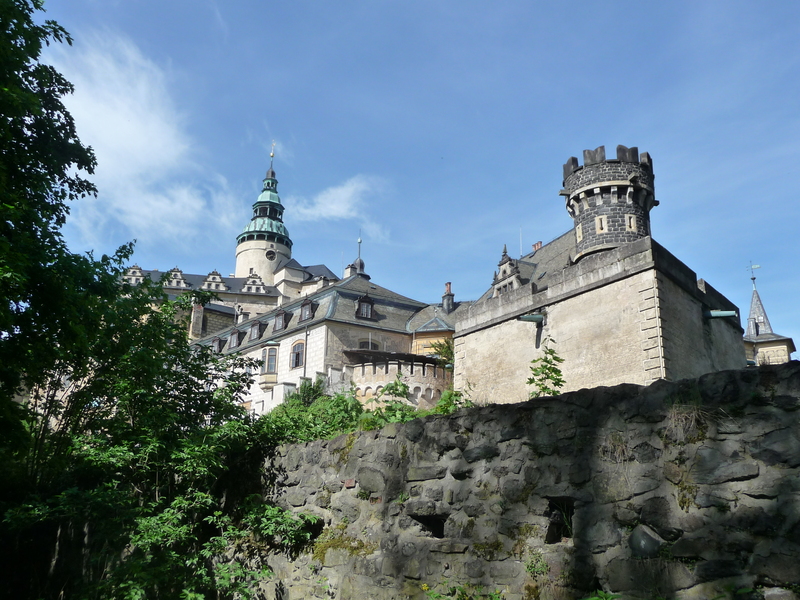 The castle was first mentioned in 1348. Jan Vratislav from Mitrovic became its owner during 1487, and Mníšek pod Brdy stayed in his family for 168 years. 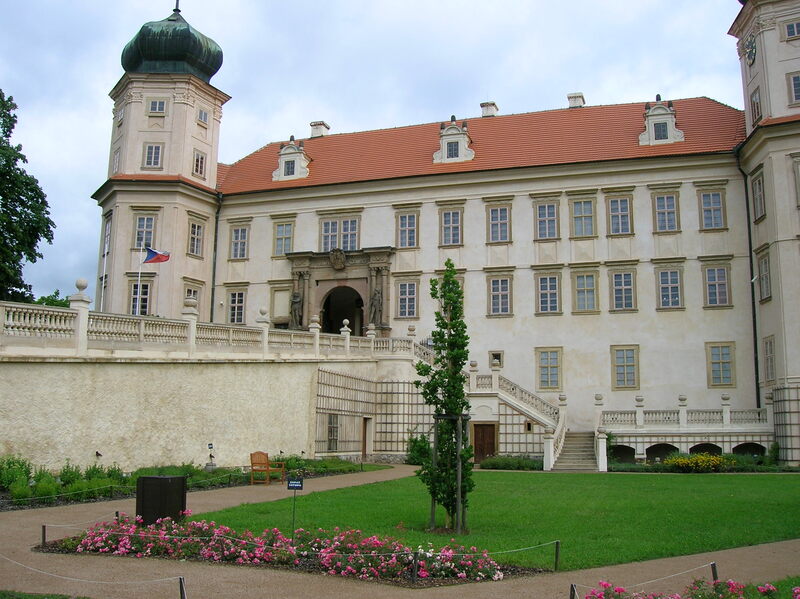 During the Mitrovic era the castle was turned into a Renaissance chateau. However, the history of Mníšek pod Brdy Chateau was not all rosy. The chateau was almost destroyed in 1639 during the Thirty Years’ War. 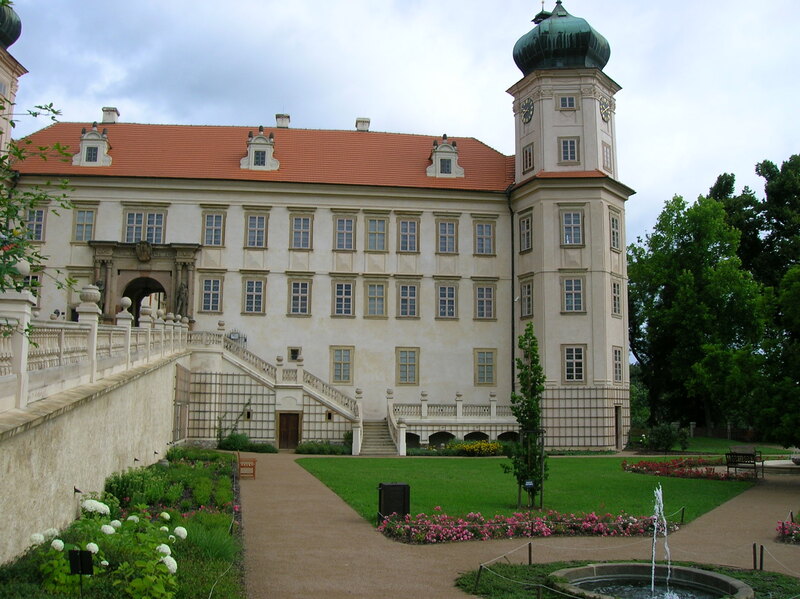 Luckily, when Servác Engel from Engelsfluss purchased it in 1655, he transformed the ruins into a Baroque masterpiece. Several other clans claimed ownership before the Kasts took over. Because Baron Kast had collaborated with the Nazis during World War II, the chateau was put in the hands of the state during 1945. 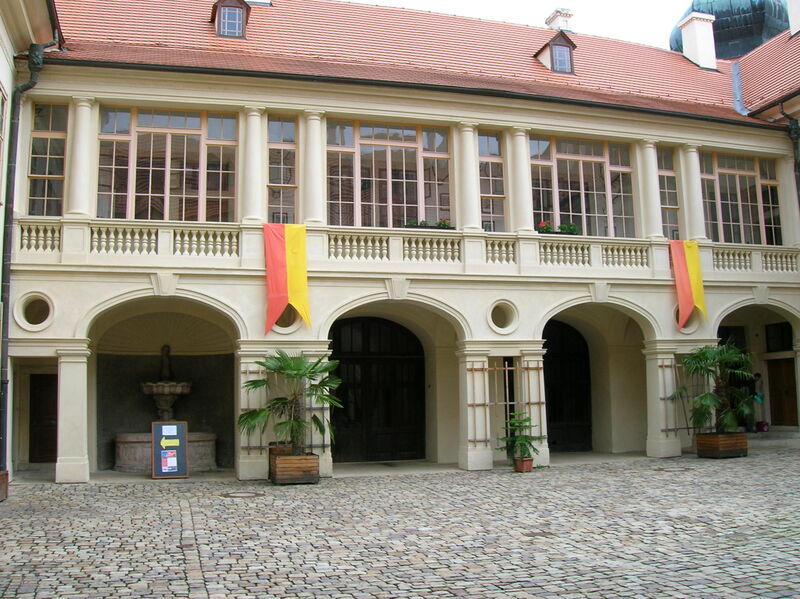 Once utilized as an archive for the Ministry of the Interior, Mníšek pod Brdy Chateau was taken over by the Ministry of Culture in 2000. 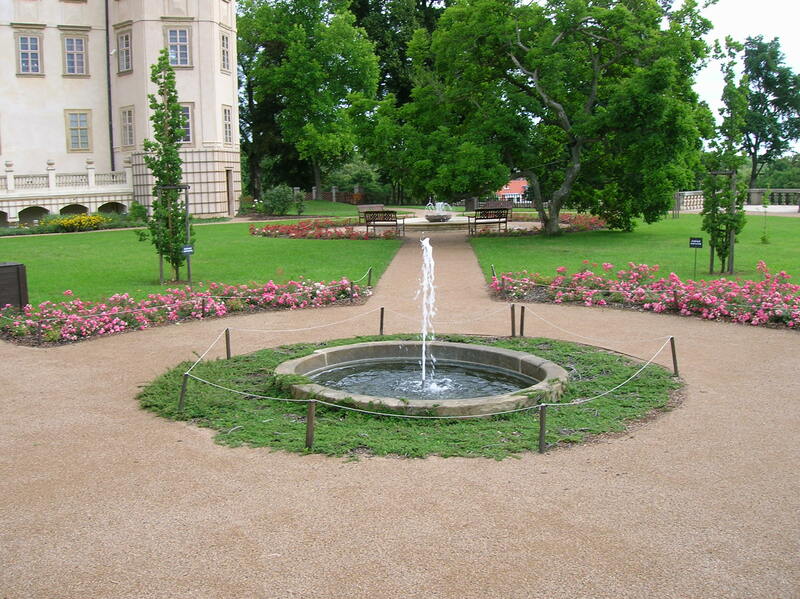 It was reconstructed in 2001 and opened to the public a few years later. Even the entranceway did not disappoint. The knight’s armor on the wall hailed from the Thirty Years’ War. A Baroque closet, designed with intarsia, was charming. 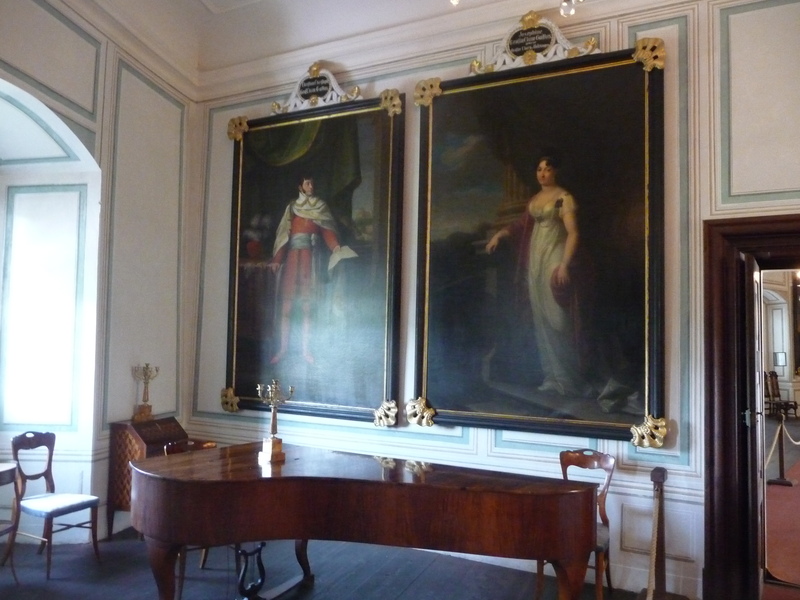 Portraits of family members who owned the castle during the 19th century also adorned the space. The moment I set my eyes on the knights’ armor, I thought of my first visit here, with Pavel, whose job involved restoring artifacts in castles and chateaus in central Bohemia. He had proudly pointed out that he had repaired that suit of armor, and he had been the one who told me about this chateau in the first place. We had met at Frýdlant v Čechách Castle and Chateau a month earlier. He had explained that he had a girlfriend, but she did not really like visiting castles. So he often traveled alone. I was alone as well. I appreciated his friendship. 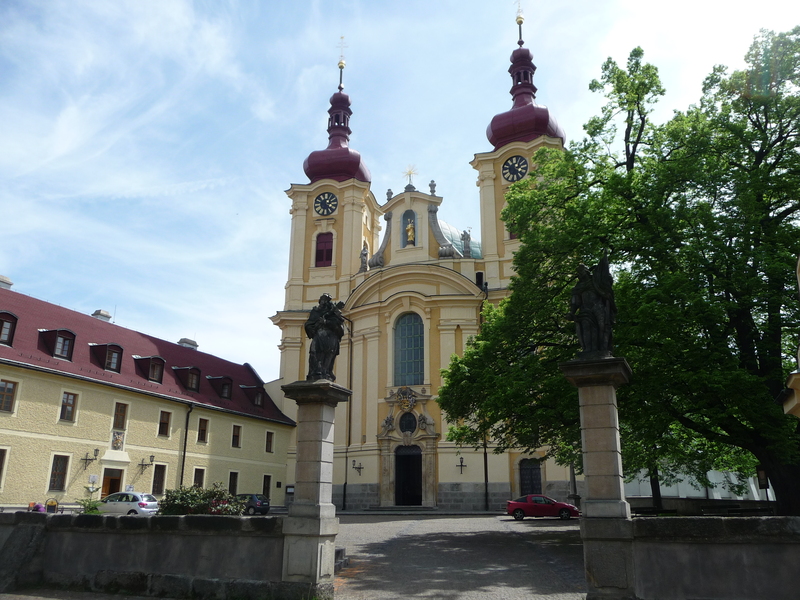 Then he had showed me around Kutná Hora, his hometown. The next time we saw each other, we came here. We were captivated by the chateau and then had lunch in a pizzeria in Prague. The Winter Dining Room was first on the itinerary. I admired a closet that hailed from the second half of the 17th century. The impressive ceiling painting also dated from that period. There were three sculptures in the chapel. An angel in a dramatic pose stood out on black, swirling columns. I was drawn to the landscape paintings on a wall in the Dining Room. I loved landscape paintings and how they depicted nature’s moods. Some works portrayed the land as idyllic while others emphasized that nature could be intimidating and even cruel. I also admired a jewel chest with intarsia. On one wall colorful plates with Oriental motifs dated from the 18th century. 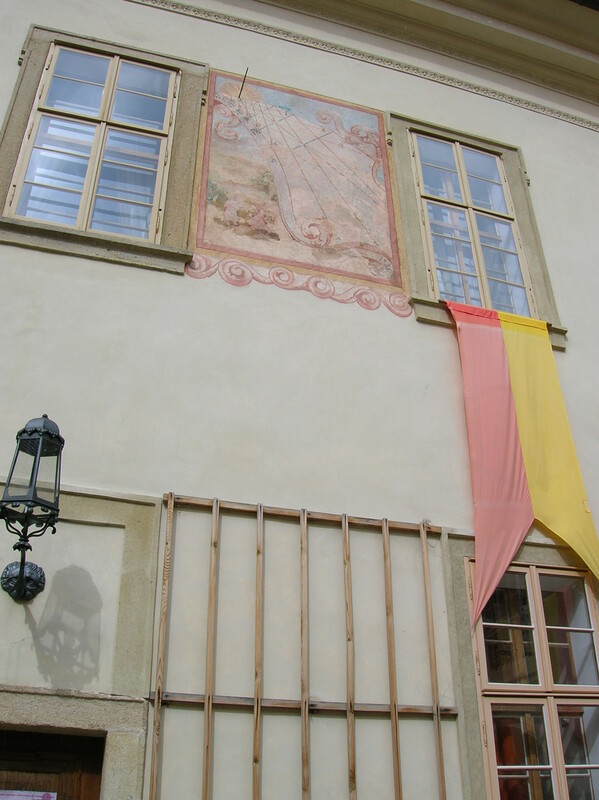 The chantry in front of the chapel was the work of legendary Czech artist Karel Škréta. The Big Dining Room was only used for special occasions. Four huge paintings represented earth, water, air and fire, according to the enthusiastic guide with a contagious smile and strong voice. In the allegory of the earth, the man dominating the picture wielded an axe, looking quite intimidating. The white tiled stove shaped as a pyramid exuded the Classicist style. The bottom part of a closet was false, hiding a stairway. Holy Roman Emperor Charles VI made an appearance, too, in a painting depicting a moment in front of the Czech court, shortly after his coronation during 1722. Candlesticks sported designs of swirls and green leaves. I loved the details in objects found in castles and chateaus. The decoration on the candlesticks was just one example of those details that made the object unique and intriguing. The Servery, where food was prepared, included a closet made in Baroque style at the beginning of the 20th century. Flowers and birds dominated wall paintings. The delicate porcelain on the table was created in Vienna during the first half of the 19th century. There was also an 18th century depiction of a big, white rooster with a colored face and brilliant feathers. The striking colors of the feathers caught my attention. This certainly was a piece that stood out. I had never seen a rooster portrayed this way. The wall flaunted a floral pattern on a tan background with the delicate flowers appearing in pink and blue hues. The Great Salon was next. The furniture hailed from the first half of the 19th century. A picture above the door showed Mníšek and its surroundings with a church. The symbols of hunting were very pronounced: A bear, sword, horn and rifle, among others, adorned the landscape. Across the space, on the wall above the entrance to the clock tower, more scenery of Mníšek was portrayed, this time accompanied by medical symbols such as a mask, an arrow and birds. Above the door leading to the following room, I could see what Mníšek Chateau looked like at the beginning of the 20th century. In the clock tower to one side of the space, there were four grandfather clocks. The one with red, black and brown decoration attracted me the most. The red complemented the black and brown colors and gave the clock a certain vibrancy. In the next room a jewel chest from 18th century Japan was captivating, designed with pictures of the countryside and birds. I marveled at the exquisitely painted drawers. The stucco ceiling of the Smoking Salon had original plastic ornamentation from the 18th century. A pelican was one dominant figure. I do not think I had ever seen a pelican on a stucco ceiling of a chateau. I loved the surprises this chateau offered, first the rooster with the brilliant feathers and now a depiction of a pelican. I loved tours that held surprises for me. The dark crimson color of the walls was also appealing. A card table with indentations for money hailed from the first half of the 18th century. A still functional bright red gramophone dated from 1890. Then we entered the Ladies’ Salon. The paintings on the wall were framed in Secession style. The décor on the walls showed putti as well as people relaxing in the countryside alongside red and green flowers. Meissen porcelain went back to the 18th century. A toiletry table intrigued me. If you turned up the central part, there was a mirror. Set down, it became a desk. The library, with 2,000 books, hailed from the Kast family’s era in the chateau. The volumes were in English, French and German. The decoration on the ceiling captivated me. One section showed Venus’ engagement and the other portrayed Venus and Mars, accompanied by fluttering angels, with their son Eros. I loved how mythology was often represented in castle and chateau decorations. Greek and Roman mythology had intrigued me ever since I took a course on that subject at university. All the different attributes for the gods, the captivating stories and their morals – they fascinated me. A unique bell was also in the room. It was shaped like a round, pudgy woman. We had a 20-minute break before the second tour. I wondered if Pavel had already been on the second route. He probably had, I mused. I thought back to our conversation in the pizzeria in Prague after we had seen this chateau. He told me that he had broken up with his girlfriend, and he had time to visit me every weekend in Prague. I had valued our friendship, but I did not want to date him. He was much younger than I was and a bit naïve about the world. I stressed that I was only looking for a friend, not a boyfriend, and he was suddenly quiet as he picked at his lasagna. How many times had a man I was interested in told me that he just wanted to be friends? Or how many times did a man I like express no interest in me at all? It happened to me all the time, and it was painful. But I could not lie to Pavel because I cared about his feelings. After some minutes, he smiled – a forced smile – and began talking about a chateau near Brno where he planned to go some time the following month. He did not invite me to go with him. I was so lost in thought that I did not hear the guide announce the beginning of the second tour. I was one of the last people to enter the first room. 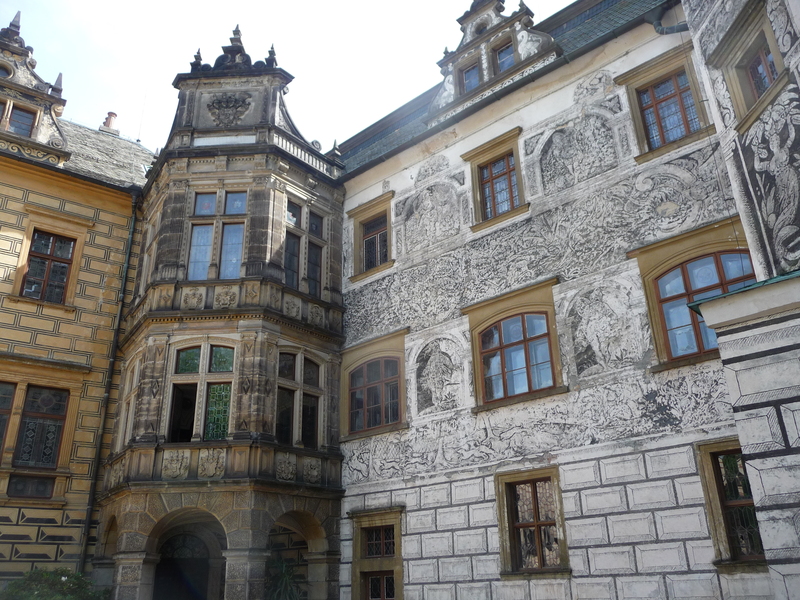 The second route featured the private apartments of Theodorich Kast and his wife. Framed embroideries complemented small, family photos. I wondered if his family life had been complicated as were my relationships. The family photos had an idyllic quality about them. It looked like Kast had a happy family, free of worries or tension. The guide showed us one intriguing invention. A doll with a wide dress could be placed over a kettle to keep the water hot. This was another pleasant surprise for me. I had never seen such an object before. Yes, Mníšek pod Brdy was full of surprises. I noticed that the woman dressed in blue in one portrait closely resembled legendary 19th century Czech writer Božena Němcová with her fragile, round face. Like Němcová she wore a sad but resilient expression and had sorrowful eyes and straight, black hair. I had read Němcová’s The Grandmother several times and had seen the play by Brno’s Divadlo Husa na provázku and film versions as well. 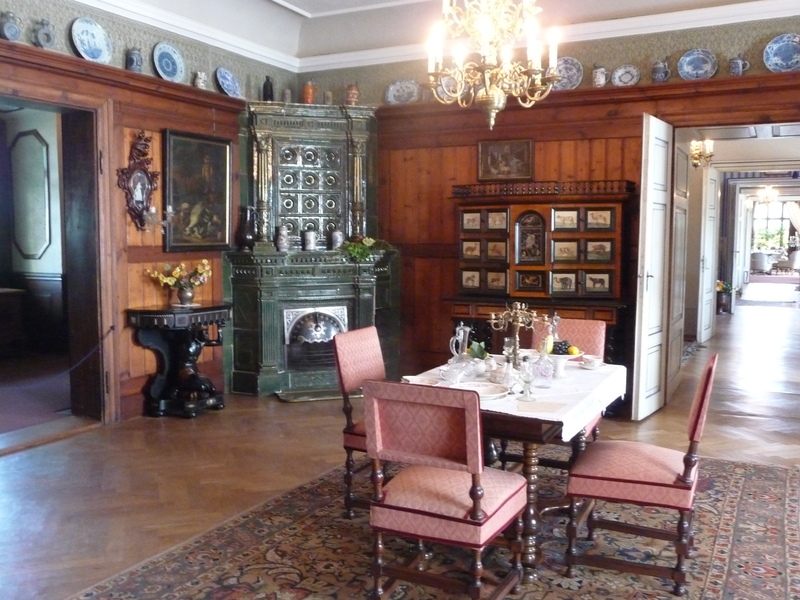 The following room belonged to the husband Theodorich. A jumble of black-and-white photos decorated the walls. The old telephone had no numbers, only a receiver. A heart with a black outline was carved into the headboard of the wooden bed. This was another example of a detail that captured my attention. The heart decoration made the bed unique and exquisite. The next room showed off photos and paintings of horses. I had never been enthusiastic about horses. I was afraid of them. I would never ride a horse because I would be too scared that I would fall off or be thrown off. I thought of a friend whose teenage daughter had been thrown from a horse and had died, only 15 years old. Yet I knew many people were enthusiastic about the sport and did not get injured. I focused on the tour again. Two small cases resembled hat boxes, but they weren’t. Instead, they were meant to be used on picnics. One hid a jug that could be kept warm while the other was really a chemical toilet. The Children’s Room was decorated in white. Three dolls from the beginning of the 20th century sat on a children’s sofa. Two glass parrots that look like owls served as electric lamps above the desk. In a doll house I was drawn to the colorful decorative lamp shades. A model of a school could be seen in one corner of the room. Inside, I noticed wooden benches, a podium, a blackboard and pictures of animals on a miniature wall. I recalled how simple life had seemed when I had been a grade school student and how complex it had become when I had reached adulthood. Sometimes I longed for those simple days when the world was black-and-white, everything was good or evil. There were no gray areas to confuse or upset me. The next room was meant for a mother and a small baby. I noticed another tea doll. Exquisite clothes for an infant were displayed on the crib. An 18th century Venetian mirror also made an appearance. I admired the simple gold design on the headboard of the bed as well as the gold decoration on a closet. The Ladies’ Bathroom included not only a flushing toilet, bidet and narrow tub, but also a selection of women’s and children’s shoes. The purple women’s footwear stood out. I remembered my outing to the extraordinary shoe museum in Zlín in Moravia a few years back. I had never realized that footwear could be so fascinating. Hat boxes took up space on the highest shelf. We left the rooms after passing by graphics in the hallway. 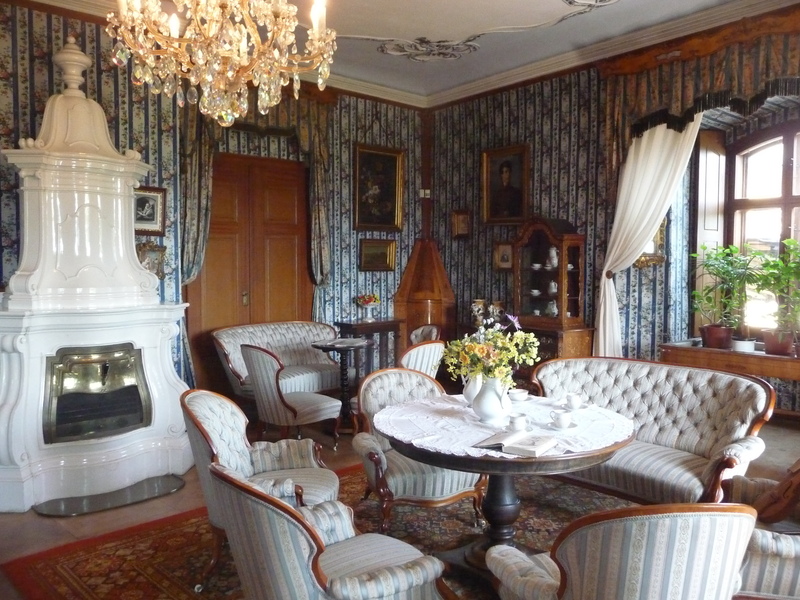 Once again, I was charmed by the chateau with its modest, though extremely appealing, décor. Mníšek pod Brdy had a romantic flair. No object in the chateau really stood out from the others. All the artifacts complemented each other to give a breathtaking impression. I loved the small details on the artifacts. Mníšek pod Brdy Chateau was a place I would love to visit once a year, I decided. It was a sunny, summer day. The weather was perfect. I was happy. I was even happy to be here alone. Part of me missed Pavel’s presence, but I realized that it had to have played out the way it did. At some point during the second tour, I had stopped wishing Pavel and I could have gone on being just friends and had accepted what was. It was fate. Suddenly, for a short time, life seemed simple. As simple as the life represented by the dollhouse and model of the school in the Children’s Room. If only life could always be this simple! I headed to the nearby main square, where I ate my favorite chicken with peaches and cheese before catching a bus back to Prague. Yes, I was happy. For the first time in a long while I went on a trip by car. 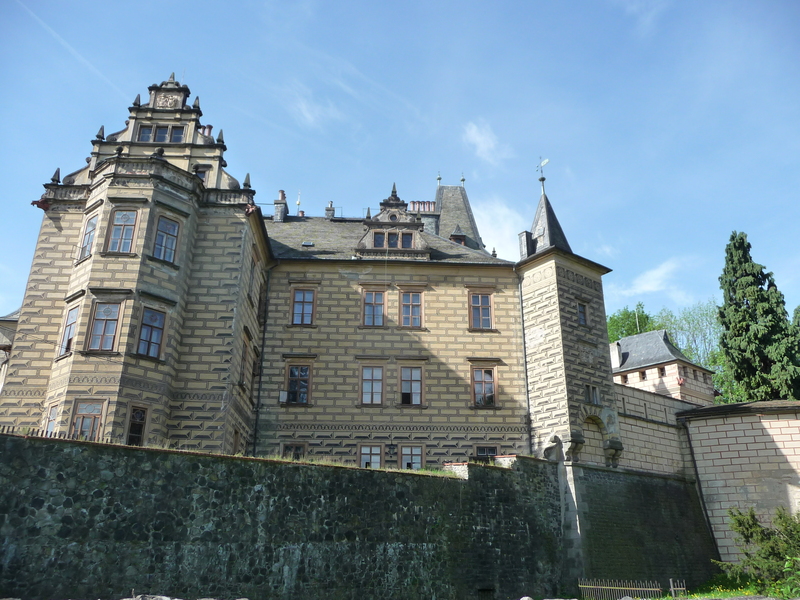 Since my friend did not have a highway sticker that permitted her to drive on the highways, we had to take side roads that made the trip to northern Bohemia’s Frýdlant Castle and Chateau more than three hours long but much more scenic and intriguing. I already was familiar with the history of the mammoth castle and chateau complex, as I had visited it eight years earlier. The first reference to the impressive sight went back to 1278, when the castle was sold to the Bibrštejn clan who ruled here for 300 years. 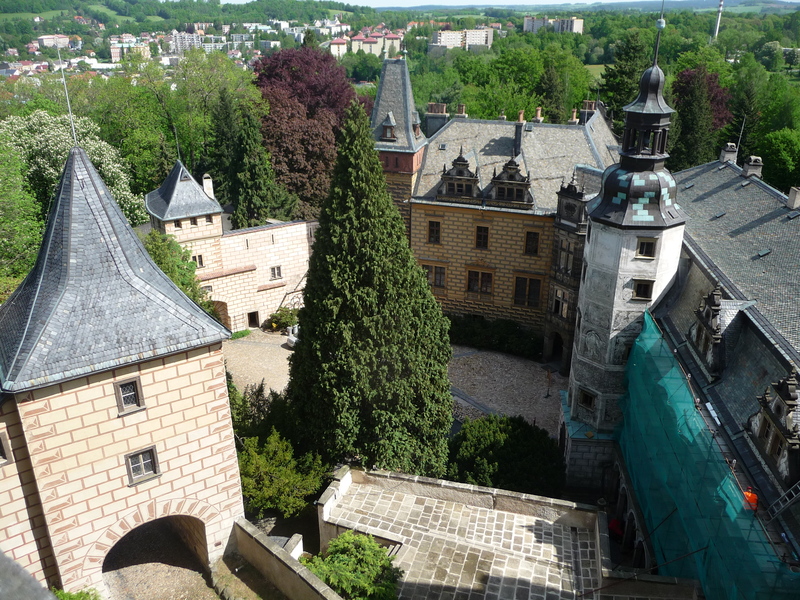 During the 15th century Hussite wars, the Hussites did not capture the castle, as it was spared the Hussites’ wrath that had destroyed so many sites throughout the Czech lands. The chateau came into existence at the beginning of the 17th century, when Catherine of Redern had it constructed with sgraffito decoration. She also was responsible for adding the exquisite church. Protestant noble Kryštof of Redern participated in the uprising against the Catholics during the Battle of White Mountain in 1620, and after the Protestants lost, Frýdlant was confiscated. Albrecht von Wallenstein, commander of the Habsburg armies and a major player in the Thirty Years’ War, bought the place during 1622. However, Holy Roman Emperor Ferdinand II started to distrust him and in effect gave him a pink slip. When the Protestants notched some victories over the Catholics, Ferdinand asked him for help again, and help he did. Yet, when in 1633 Wallenstein did not attack the enemy during a battle, he was accused of high treason. Unhappy with the way the emperor treated him, he had also been thinking about joining the Protestants. But he would not have the chance. Emperor Ferdinand II had Irish army officer Walter Devereux assassinate Wallenstein in Cheb during 1634. 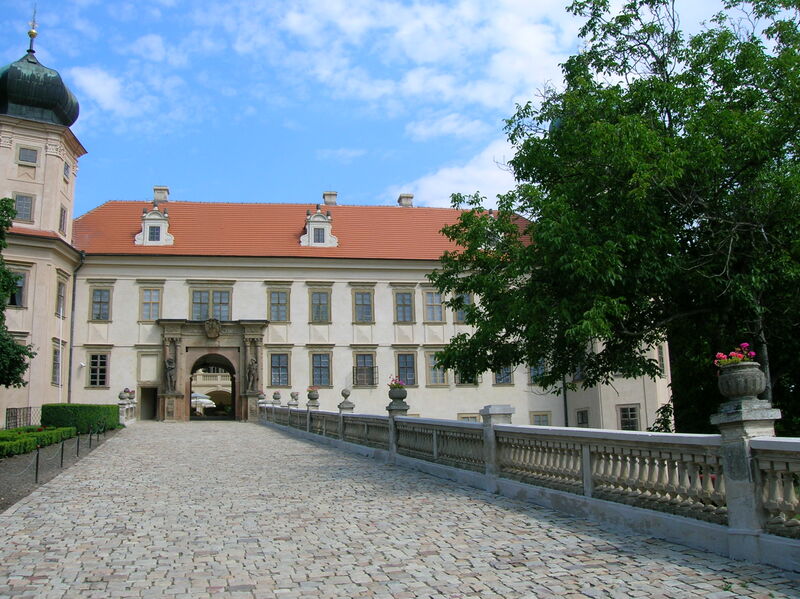 Then Wallenstein’s General Matyáš Gallas took over the castle. The Gallas family owned Frýdlant until 1759, when the Clam-Gallas family became the owners. 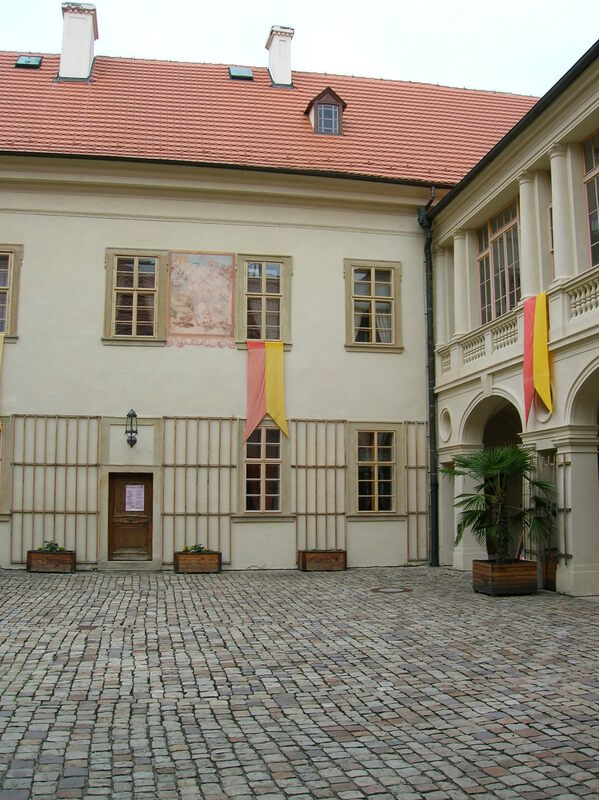 The castle museum opened in 1801. In 1945 Frýdlant was confiscated due to the Beneš decrees that ceded all property held by Germans to the state, and it was nationalized. As we approached the castle, it was impossible not to notice the high circular wall that had been built by the Swedes in 1647. After entering the front gate, we walked over the drawbridge to what was called the Swedish courtyard, taking its name from the 17th century occupation by the Swedish army. Then we came to the courtyard of the chateau and negotiated a steep path to the castle. In the castle courtyard we peered at a 13th century round tower and saw Renaissance sgraffito on part of the castle’s wing. One part of the sgraffito portrayed a deer hunting theme. I was glad that my friend and I were the only people on the tour. We went inside. 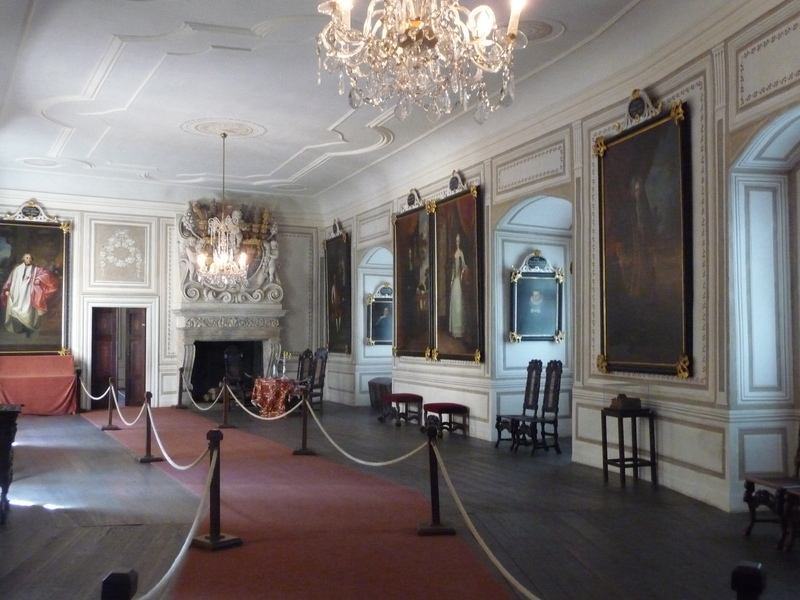 What impressed me the most in the first room were not the huge portraits of the Redern family but rather the richly carved Renaissance chairs and the Renaissance chest. The green and white tiled stove also caught my attention. In the next room a portrait of Albrecht von Wallenstein showed a man with a serious expression, a small beard and moustache. One painting in the room depicted his assassination. In the dramatic rendition Devereux stabs the unarmed Waldstein in the stomach with a halberd. Next came the Portrait Gallery, which boasted of huge paintings of Gallas family members. 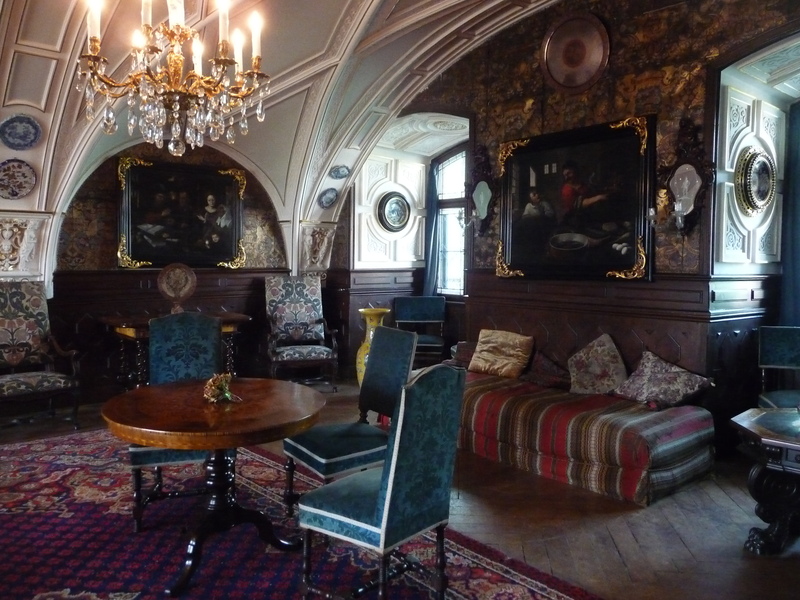 The Baroque fireplace astounded me with the Clam-Gallas coat-of-arms, cherubs and golden crowns adorning it. In the museum part of the exhibition, the legendary Czech nobleman and Austrian Marshall Jan Radecký of Radče was featured in several displays. His light blue uniform was on display as was a circular portrait of Radecký with gray hair and a gray moustache. A picture of Emperor Franz Joseph I’s wife, Empress Elizabeth (Sissy), who was assassinated in 1898, decorated a cup. A likeness of Emperor of Austria and King of Bohemia Franz Joseph I adorned a silver medal. 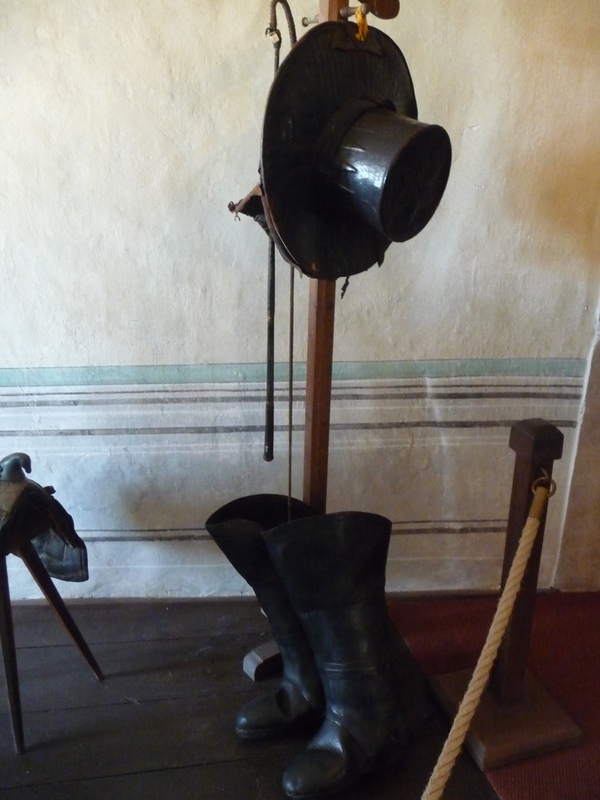 Then we entered a room featuring many uniforms for the servants during the 19th century. I was surprised that the summer clothing for the carriage driver was so warm and heavy. He must have been burning up inside that thick attire. The embroidery on the sleeves and shoulders for the estate’s clerks was detailed and exquisite as well. Following the guide, we saw a narrow, yellow women’s carriage. A Baroque sleigh was decorated with a dolphin that looked like a dragon – that was how the dolphin was rendered during those days. The Hunting Salon featured a table of 130-year old wood. In the Dining Room I saw a vibrant Baroque light green and yellow tiled stove. I particularly noticed the emperor’s eagle carved on the back of a black chair that also sported a golden crown. The armory was a treat for those interested in weaponry. Even I was enthralled by it, though weapons are certainly not my cup of tea. 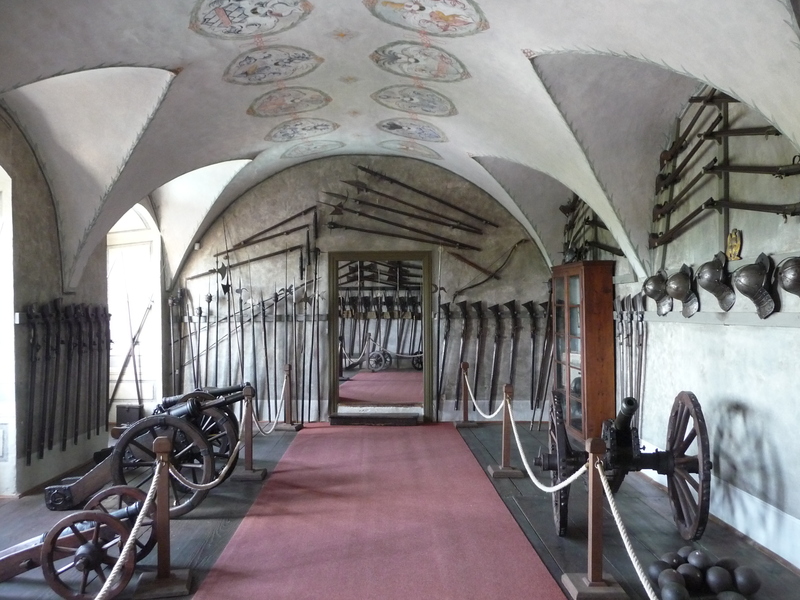 Helmets, cannons, spears and knights’ armor adorned the rooms. Some of the spears came from the 15th century Hussite wars; it was hard for me to grasp that I was looking at spears that were so old. Muskets also made appearances as did rifles from the 17th century Thirty Years’ War. What intrigued me the most in the spaces was not a weapon but rather the huge hat and large boots that couriers had worn. The hat was so big because the messenger needed to store the letters inside it in order to keep them dry when it rained. Soon we arrived at the exquisite, stunning chapel. The black and gold altar practically glimmered in the space. While the chapel was built in the 16th and 17th centuries, it now had a 19th century appearance. A gold Renaissance altar also greeted me with its ornate Renaissance pulpit. Saints were gathered around the Baroque altar. A stained glass window added even more ambiance to the room. Next we came to the attic of the chateau, where rooms were designed as they had looked in the 19th century. In the servants’ room the 19th century suitcases looked more like bulky chests. The children’s room was intriguing. It included a model of the castle and chateau plus wallpaper made from the comics section of old newspapers, reminding me of today’s wallpaper featuring the Czech Little Mole character or Disney figures. The space below was called the women’s floor, primarily decorated in blue because that was the color attributed to women during the 19th century. One room was fashioned after a military tent with a blue and white painted ceiling and wallpaper of the same design. A blue and white tiled stove also contributed to the atmosphere. A Baroque closet also adorned the space. The Small Salon featured blue and white floral decorated furniture and a display case with women’s hats from the 19th century. What intrigued me most were the two Baroque cabinets with painted drawers. One drawer was decorated with pictures of animals while two others flaunted countryside scenes. The toiletry area was unique as well. There was a lounge chair that reminded me of a chair at a dentist’s office. I had never seen such a piece of furniture in chateau, let alone in a toiletry space. From the space in front of it, I could see all the rooms in the women’s section all the way down to the exquisite Flower Salon at the end. The Flower Salon made me practically dizzy with its blue and white delights. The blue and white floral wallpaper complemented the blue and white striped armchairs, making for an intimate and cozy decor. A while tiled stove also stood in the room. The lovely tea set was Rococo, hailing from the 19th century. To give the room an even more dignified touch, a violin was set on a chair. The marble brown table with white ornamentation also entranced. Plants decorated the room, too, bringing it to life, so that it became more than a museum space. In the hallway of the Castellan wing, I noticed an engraving of Rome from the 18th century. I could see the Coliseum, which evoked fond memories of showing that sight to my parents a few years earlier. In the entertainment room hung two renderings of battles from antiquity. The Morning Drawing Room would not have been my ideal place to spend my mornings or any other part of the day for that matter, because it was decorated with hunting still lifes that featured dead birds. Birdwatchers would no doubt be enthused, though, as some of the dead birds portrayed were no longer found in the Czech lands. Another painting that did not impress me featured a dead deer. Certainly not my idea of how to start off the day. But the Women’s Bedroom did not disappoint. The intarsia table, jewel chest and Baroque dresser with intarsia charmed me. 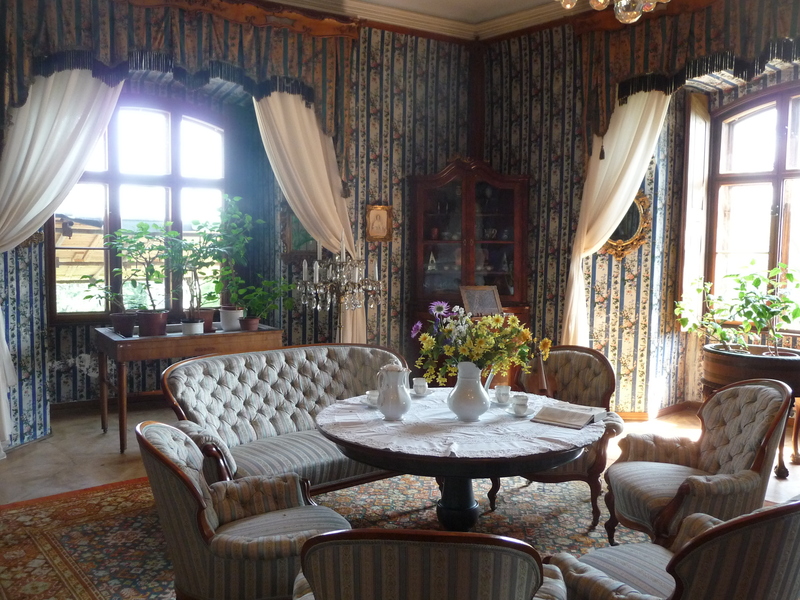 Yet another room was decorated with furniture from the 19th century in Biedermeier style. Next was the men’s floor. The Men’s Bedroom featured a hidden door that led to the women’s floor above and a lovely Baroque closet. The leather wallpaper in the Smoking Salon was gold with green in a floral pattern. 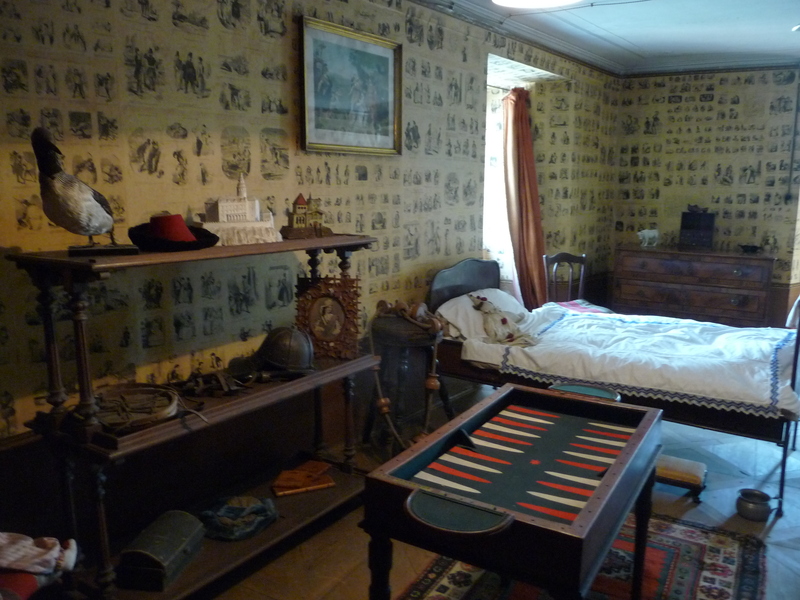 The next room was decorated with leather wallpaper and English style blue furniture. A red and blue carpet made the room cozy yet lively as well. The Coat-of-Arms Salon enthralled me. The dark green fireplace with white columns had a dignified air. On the walls I saw the coat-of-arms of the families that had owned the castle and chateau from the Berka and Dub clan to the Clam-Gallas group. I noticed the blue and yellow wheel on the Redern dynasty’s coat-of-arms and the yellow and light blue stripes of the Gallas family’s coat-of-arms. 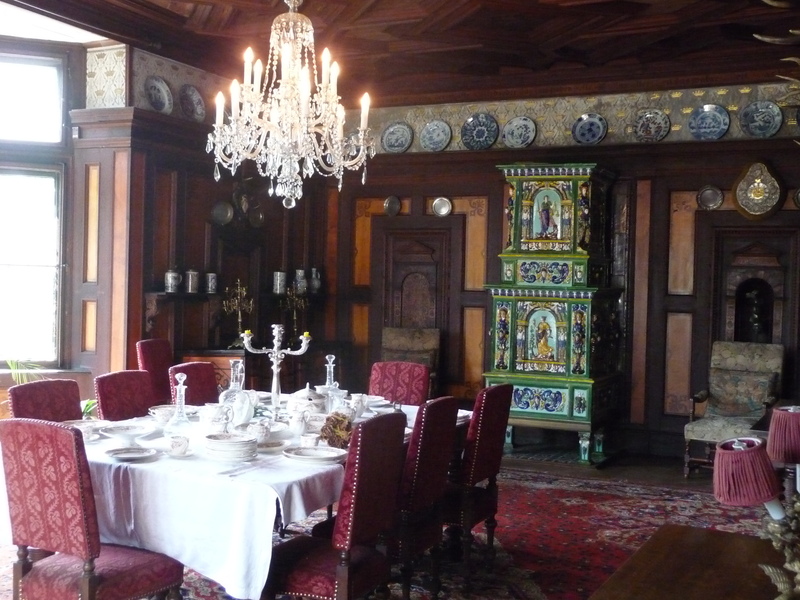 The Dining Room was one of the last rooms on the tour. Velvet chairs with comfortable cushions and a red and blue carpet gave the space a lush appearance. The ornate green tiled stove was decorated with blue and yellow figures. Blue and white porcelain hung from the top of the walls. What I loved most about the space, though, was the richly carved wood paneling. The Baroque bureaus with intarsia greatly impressed me as well. In the still functioning large kitchen areas downstairs I was enamored by what was the largest collection of copper dishes I had ever seen, perhaps the biggest in the Czech Republic. The tour took almost two hours. 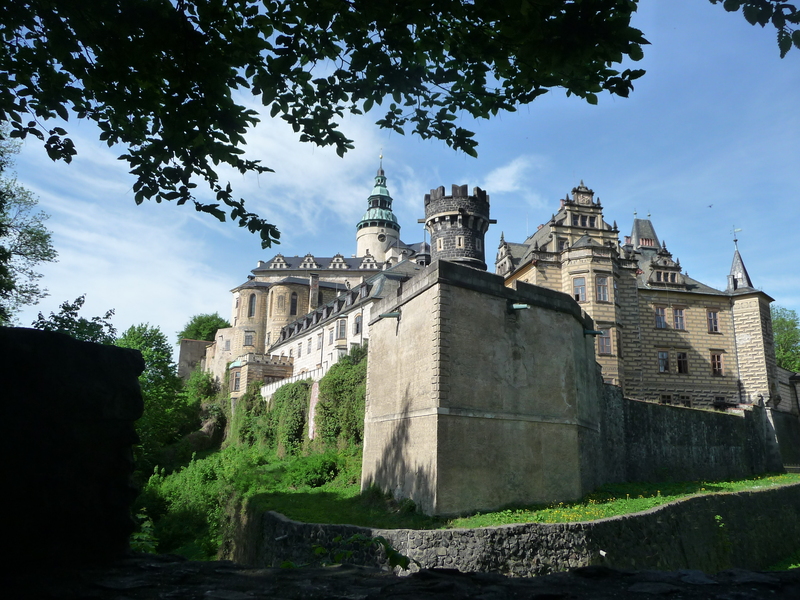 I loved long tours of castles! I would be happy to be on a tour that lasted four or five hours! I could spend all day in a castle or chateau. Thanks to our knowledgeable guide, we enjoyed the tour immensely. 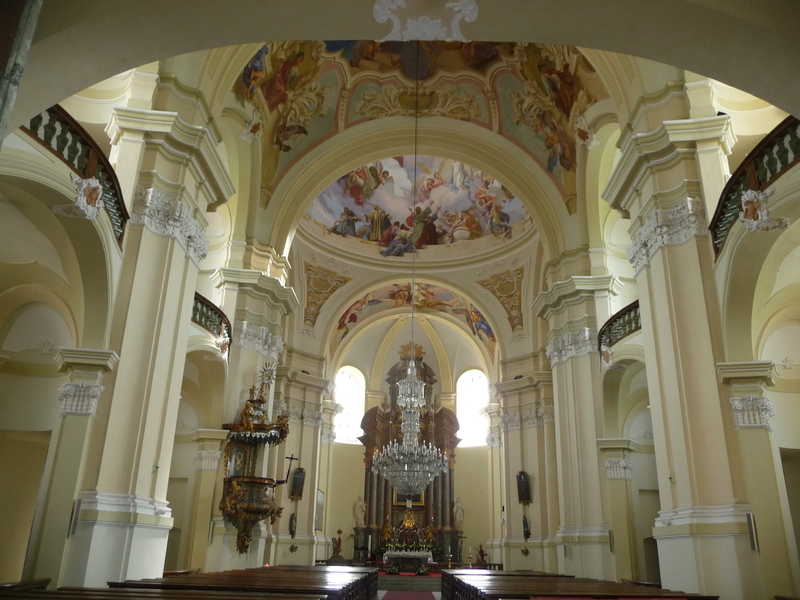 After visiting Frýdlant, we made our way to the basilica in a village called Hejnice, but we often got lost one-lane roads with two-way traffic. 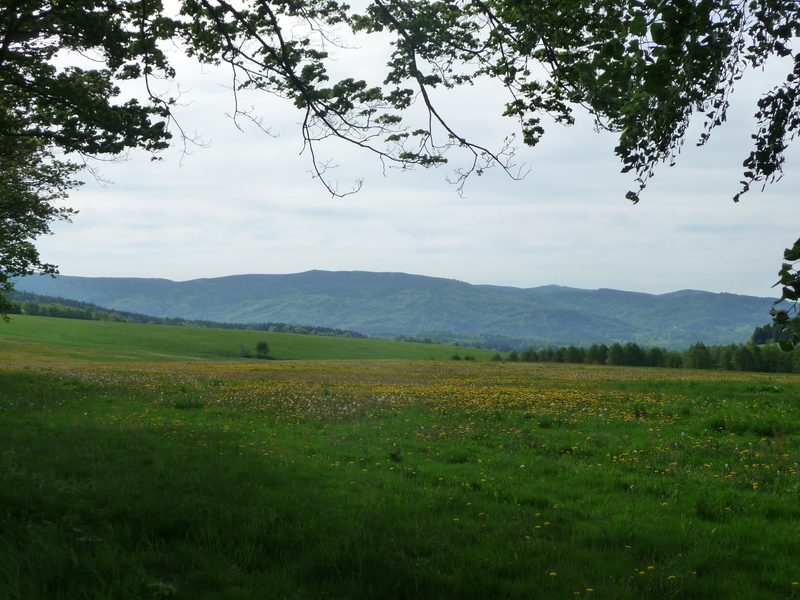 The scenery in the Jizerské Mountains was breathtaking. 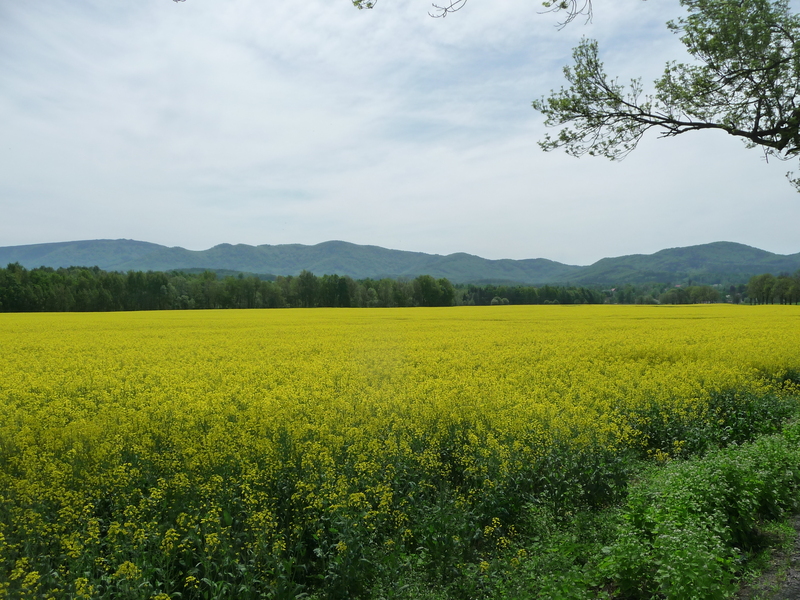 At one point we were driving down a narrow road flanked by trees, yellow and green fields surrounding us. It was so peaceful and tranquil, just as I imagined the road to Heaven. So relaxing, putting my mind entirely at ease –until a truck came straight at us on the one-lane road. We moved over to the side, partially on the grass and let it pass us. Still, we did not get much of a warning on that winding road whenever a car would come at us from the other direction. Traveling through the Jizerské Mountains, I realized how devastated the area had been by the floods of the previous year. Whole villages had been practically destroyed, homes in ruins. Barriers put up along rivers were now bent and deformed. The roads were in awful shape, too. I thought back to the floods of 2002 in Prague and the devastation that the natural disaster had unleashed on the capital city. I felt as if I was riding through an area that had just witnessed a war. It brought to mind the damaged chairs and tables littering the sidewalks of Prague during 2002, so many homes and businesses destroyed. And thoughts of my good friend’s flat decimated in Prague’s Karlín district. It was still hard for me to believe that the flat where we had spent much time discussing anything and everything over cups of Earl Grey tea had been destroyed. I thought of the damaged theatres where I had worked, too. And I thought of the damage in my own flat because workers had been repairing the roof when the downpour had accompanied the floods. Mold everywhere, wet, wool sweaters destroyed, my cat traumatized – at least my home had survived in one piece, and most of my belongings had been saved. Riding through the destruction wrought by those floods in the Liberec region made me realize how quickly we can lose something precious to us and how we have to value each moment in life because drastic change can come at any time, anywhere. 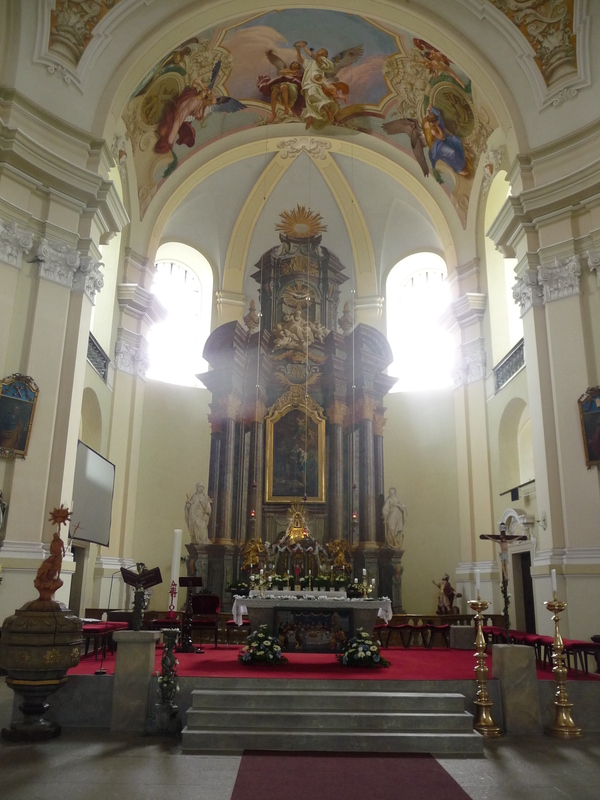 Hejnice Basilica seemed to magically appear in a village nestled in the Jizerské Mountains. The Baroque masterpiece used to be, back in the 13th century, a stone chapel with Gothic vaults. Ambulatories were built around the Gothic church in 1676. By 1725, the church was able to hold 1,000 pilgrims. Between 1699 and 1725 there were 1,381,176 people who came here to pray to Our Lady. After suffering a fire in 1761, the religious site was rebuilt during only 18 months. By the beginning of the 19th century, though, the church was plundered and all its valuable items stolen. 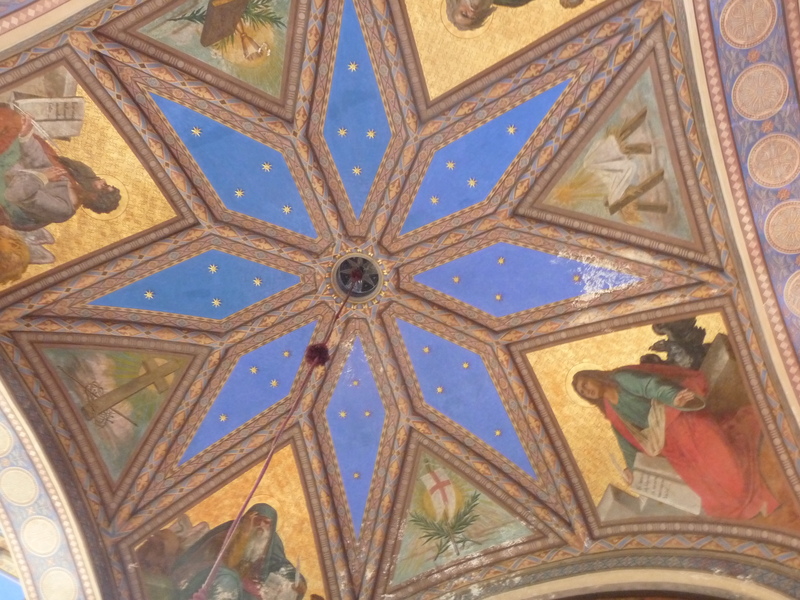 But restorations took place, and in 1936 the church was proclaimed basilica minor. After the war, however, Germans living in Hejnice were expelled from the country, including the Franciscans who lived in the church’s monastery. In 1950 all monks there were arrested and forced to leave the basilica, and the monastery became a concentration camp of sorts under the Communist government. Later, the monastery served as a school cafeteria and a kindergarten. Not surprisingly, the place that was once a glorious pilgrimage site found itself in ruins during the 1970s and 1980s. Thankfully, the church was renovated and restored after the Velvet Revolution of 1989. 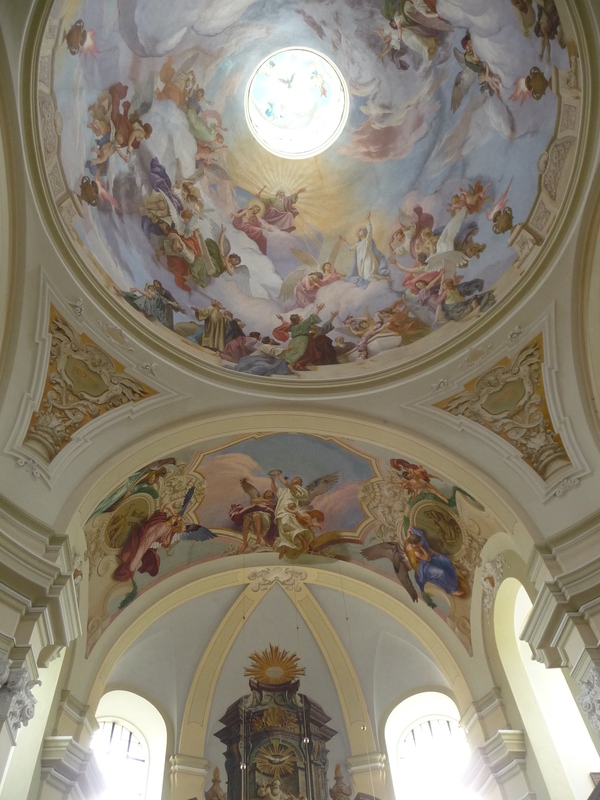 One step inside and the frescoes and main altar enthralled me with their beauty and charm. 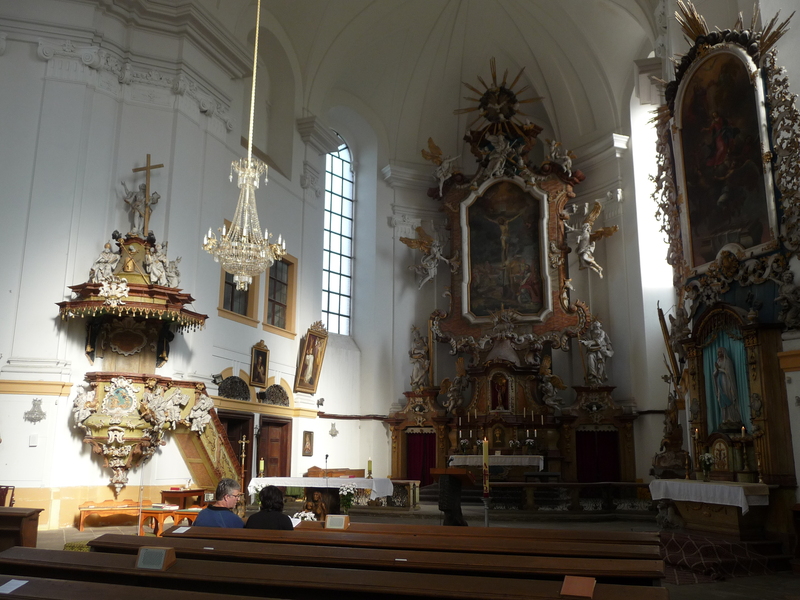 I could hardly believe that the main altar was illusionary. An architectural feat, it was painted onto the wall rather than three-dimensional. The ground plan of the basilica took the form of a long cross. At the entrance I admired the two towers with a central convex buttress. In a niche I noticed the statue of the Hejnice Madonna. The vastness of the space awed me. The basilica is the biggest cathedral in northern Bohemia, measuring 50 meters long in its southward cross and 37 meters wide. The cupola is 35 meters high. The central cupola fascinated me. Supported by four Corinthian columns, it was decorated with frescoes portraying events in the life of the Virgin Mary and Jesus Christ. Above the main cupola scenes depicting the crucifixion and the Assumption bewitch the viewer with a swirl of movement of angels along with clouds and sharp light. A group of Apostles filled with awe watch the Assumption. Some angels raise the lid of the coffin while others carry the Holy Cross to Heaven. The main altar can be divided into parts. There is the fresco of the illusionary altar, which depicts allegorical figures representing belief, hope and love. In the middle of the altar, a large altar-piece portrays Saint Elizabeth and the Virgin Mother. 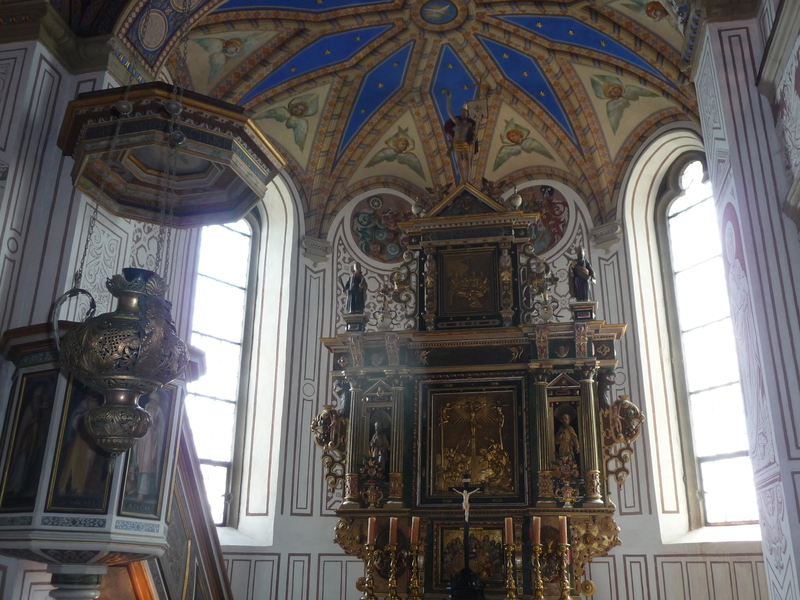 The lower part is a stone altar that includes relics of saints and a tabernacle. A Madonna made from lime wood dominates, called the Mater Formosa or Sleek Mother. It was hard to believe that the Madonna hailed from as far back as the 13th century. 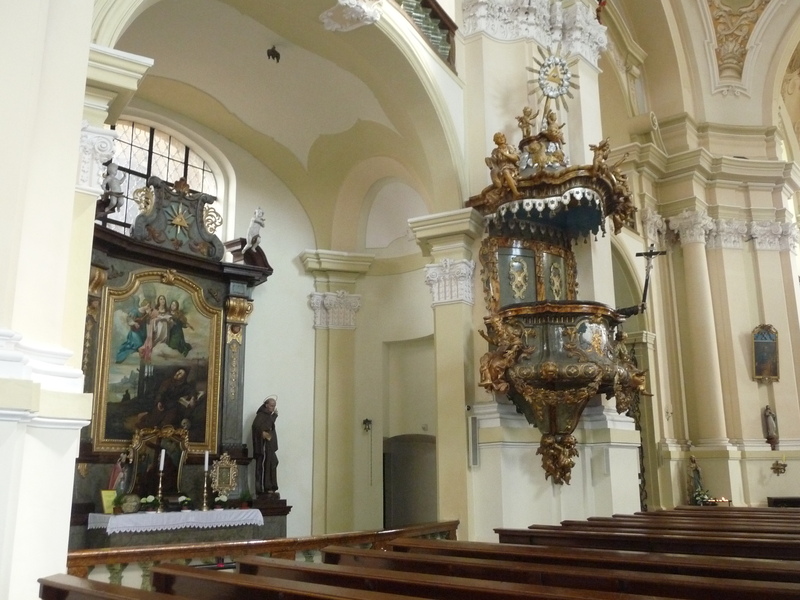 I also took special note of the pulpit, dating from 1740. Along with evangelists there was a hand holding a cross with Christ. A large chandelier also hung from the rafters. Going back through the Jizerské Mountains, along the narrow lane flanked by trees and surrounded by fields, I admired the fantastic scenery that seemed to belong in a film. 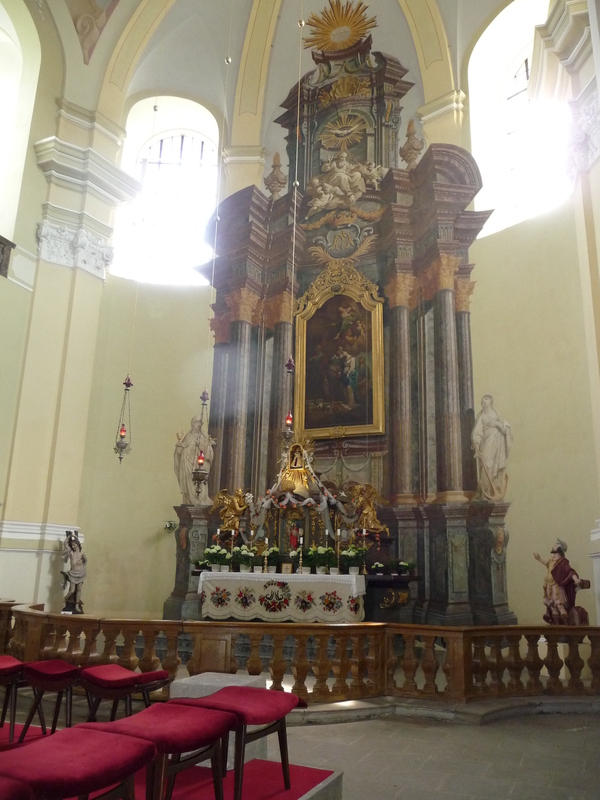 We made our way to Dubá, where we stopped at an intriguing church and then to Mělník and finally to Prague. It had been a fantastic day during which I had learned how important it was to appreciate what I had in life, to not take anything for granted. Tracy A. Burns is a writer, proofreader and editor in Prague. Some of the photos in this blog were taken by Lenka Hilbertová.